Your ideal accommodation at IMPACT. 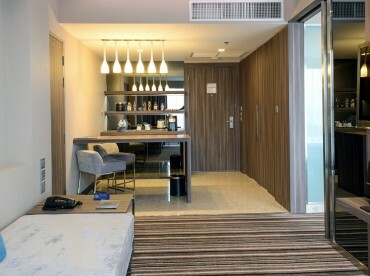 Guest rooms and suites at Novotel Bangkok IMPACT are ideal for both business and leisure travelers. Décor and furnishings are contemporary, comfortable and efficient in design. The hotels’ 380 rooms include 14 suites and 86 premier rooms. All rooms offer a flat screen television with media hub as well as satellite and cable television. Guests can also enjoy modern bathrooms, equipped with full amenities including a rain shower. An executive writing desk is available in the living area. Along with high-speed wireless internet access (throughout the hotel), fully stocked mini bar and 24-hour room service, guests can enjoy all the comforts of modern traveling. Guests can also upgrade to Premier Rooms located on floors 9 and 10 which include a dedicated lounge and service team. Choose comfort and space. 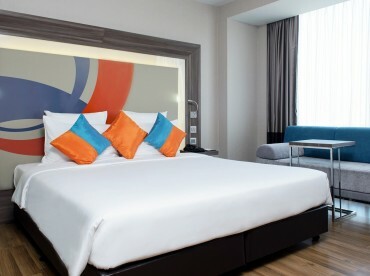 Our standard room is a great example of what Novotel is all about. Up to 2 adults.